The first time my wife and I drove with GPS navigational support was six years ago, while driving in a car rental out in San Francisco. I should first mention that my wife is the official navigator in the family. She loves maps and has only gotten lost once (in the woods) in all the time I’ve known her. It’s probably not going too far to say that I’m moderately to severely geographically challenged. I could get lost driving down a straight highway. I could blame this unfortunate fact that I grew up in New York City and never drove a car until after college. Good excuse? Well it’s my story, and I’m sticking to it. Driving around Fog City, I felt like I was in the car of the future. 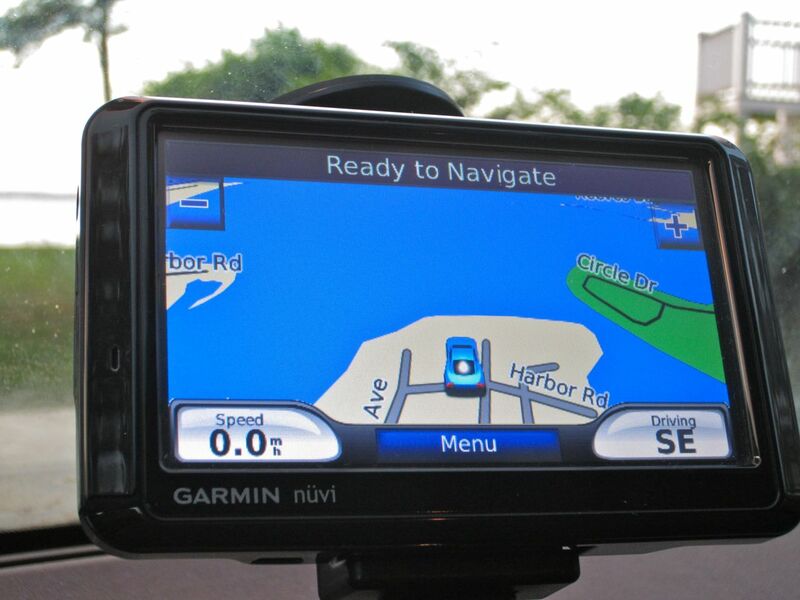 A portable navigation device using GPS (Global Positioning System) technology to take you anywhere you wanted to go. No more worrying how to get there. I was sold, before I even got into the car. My wife wasn’t so sure. I was so charmed I set the device’s voice control to dictate its directions in a smooth female Australian accent. And then I gave it a name. We ended up not following Jane’s directions much that day due to human/computer incompatibility. My wife had her map, and unless she saw the logic of the Aussie hussie, my wife called out an alternate course. The name stuck, and eventually, the two north stars in my life came to some sort of understanding, and Jane became a welcome passenger on most of our big road trips. And as of May, Garmin has sold over 100 million of its GPS products. So I’m not alone in my devotion to this magic tool that stretches my navigational capability. Deep down, though, my two navigators still don’t get along. And much like a bad movie where the “other woman” threatens the lives of a happy couple, I have finally begun to see the errors of my ways with Jane. But is it too late? First off, I’ve clearly become overly reliant on Jane. I take Jane with me down the street to get a quart of milk. New restaurant in the next town? Too far to risk getting there by myself. And now that Jane has comfortably cemented herself to my life, something strange has begun to happen. Her directions are sometimes, well… wrong. And over time, the problem has gotten worse. Her directions eventually get me where I want to go, but not always through a shortest route approach. Yes, I know that road maps need to get updated from time to time, and you’ve also got to refresh your portable GPS unit’s memory with software updates. About a year ago, I got an email from Garmin offering lifetime software updates for Jane. I took the deal, thinking I would never need to look for another portable navigator ever again. Last weekend, the Lester family got into the car to kick off our little beach vacation on the North Fork of Long Island. As usual, Jane was front and center as we headed out. I type ‘Harbor Road’ into her keypad, but before I can complete my data input, she automatically suggests ‘ Harbour’ without allowing me another option. She then happily locks in the address but also changes the two-digit house number to a non-related three-digit number. It’s like the vacation address just doesn’t exist. Am I in a Twilight Zone episode? So I pull out my iPhone and repeat the same exercise to see how the Maps app handles the task. My iPhone quickly locks into our correct route. There it is. Harbor Road, on the water. Not Harbour Road, several blocks inland with an entirely different address. So I have the flexibility to run both devices simultaneously. The two wonder machines run neck and neck until the last mile. I knew it would come down to the wire. But iPhone Maps clearly points, Left!! It was time to change the status quo. Jane proclaims her disapproval at my disobedience. I firmly repeat my navigational act of anarchy. My wife complies, and as our car begins its left turn, Jane admits defeat. And in that moment, Jane lost her grip on me. She eventually regains her composure and finally displays the original address I had wanted all along, as well as our now-correct bearing. She decides to acknowledge her error in the last minute of our journey?! I don’t think so. This is the last straw. I know. Jane and I are bonded together for life. Right? Lifetime updates with no additional cost. My change of heart has nothing to do with the recent but separate tech announcements by Google Maps and Apple promoting even greater upcoming capabilities for smartphones. And even more irrelevance for dedicated GPS devices. Nope. I’m not just reading the writing on the wall about Jane. Where’s the Nearest Flower Shop? Now I’ve got to woo back the one and only true navigator in my life. So I decide to write my wife a little note to express the error of my ways and my true regret. I’m sorry I ever doubted your navigational superiority. Artificial intelligence can never match your keen sense of direction, and your innate capability to drive around a traffic jam, leaving all others in your dust. I was wrong to ever trust Jane, when you are truly my one and only navigator. So I close the envelope and look around for my wife. It’s suddenly way too quiet. She just went shopping with a friend at a local farm stand on the side of the road, five miles away. I should go find her. But I don’t really know where she went. Excuse me. I’ve got to go and find Jane.